The Swift has space for a Double DIN stereo, although you can also fit a single DIN stereo if you prefer. You do NOT need all this! 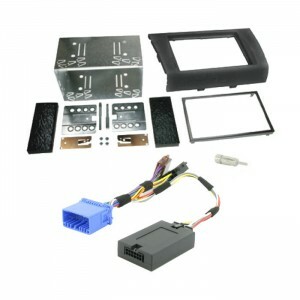 Many sellers will try to sell you a complete fitting kit, with a trim panel, cage, bezel, adaptor plates, screws, connector adaptor, and ISO-to-DIN aerial adaptor. You do NOT need all this! The only things you actually need are the trim panel (top right in the photo) and the connector adaptor (bottom of the picture). The Swift already has a DIN aerial so no aerial adaptor is needed. The cage and adaptor plates shown in the pic are simply not needed. 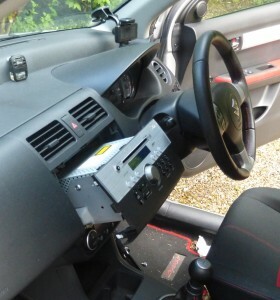 Certainly they weren’t needed on the JVC double DIN stereo that I bought (which came with a cage anyway, which I didn’t need), although I suppose it might be different for other stereos although I doubt it – after all, double DIN is an industry standard. The connector adaptor show in the picture includes a breakout box for the steering wheel controls (the dark grey box). The seller should include a patch cable specific for the manufacturer of your stereo which plugs into this. If you aren’t fussed about the steering wheel controls then simpler adaptors without this are available far more cheaply. It’s up to you really. 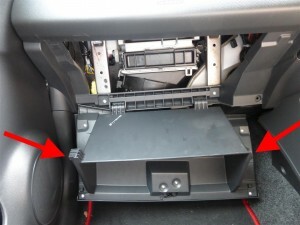 The blue connector is compatible with the Suzuki wiring plug, and the two black connectors are ISO connectors which are industry standard for connecting up stereos. 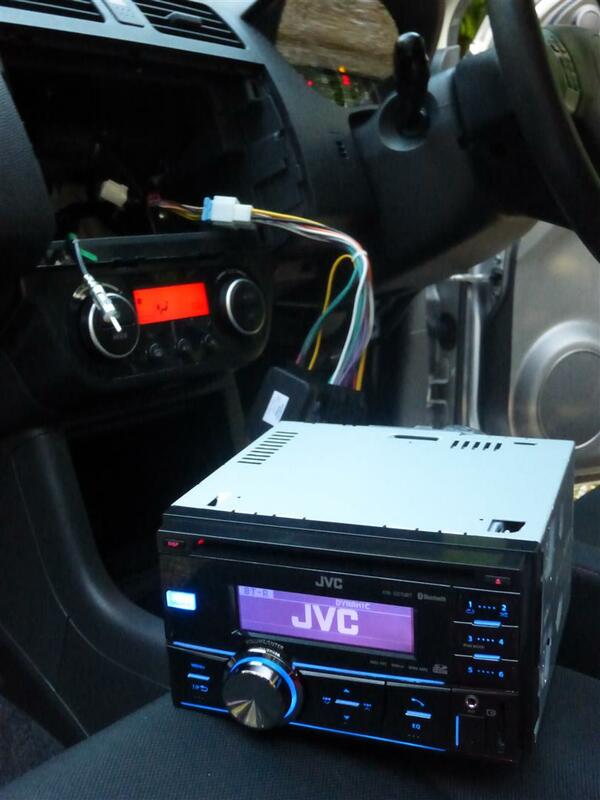 For the JVC stereo that I bought, the box included an ISO to JVC adaptor, which made my install a little bit of a mongrel as it went Suzuki -> ISO -> JVC but it seems to work ok and is all tucked up out of the way and out of sight, so all is well. Before you start bear in mind that, once disconnected, your factory-fit stereo will not work again without the security code. Please refer to the owner’s manual on how to set this. Also, make sure you remove any CD that is loaded before proceeding as, once the stereo is disconnected, you won’t be able to get it out again. The cage that holds the factory stereo is only held in with two bolts. But getting to them is the trick. Firstly, remove the glove box. This involves opening it and then deforming it so the lock stops (as indicated by arrows in the pic) slip past the plastic that they stop against – not unlike opening a child-proof container. Once this is done, the bottom of the glove box (where it hinges) just unclips and it’s out. 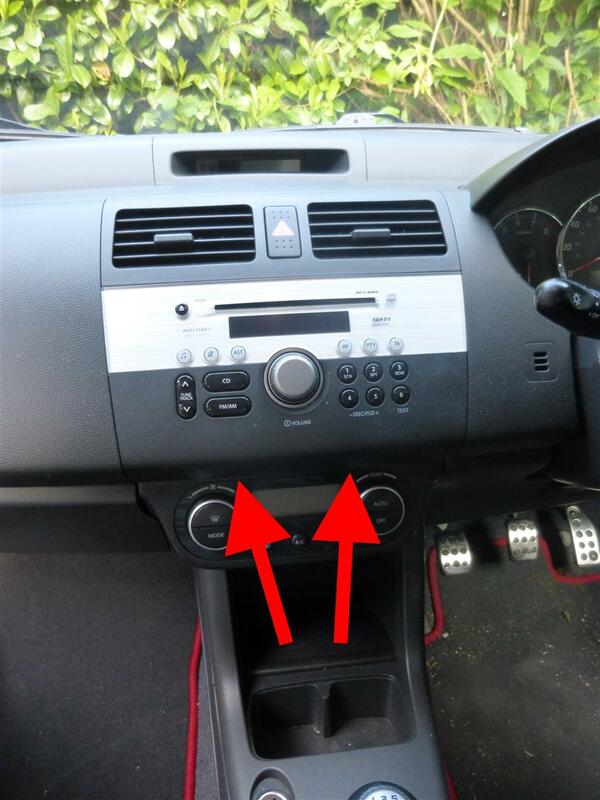 You will also need to remove the panelling on the driver’s side down near the pedals. This is simply clipped in place and pops off fairly easily. Looking up inside, you will be able to see the bolts securing the mounting cage – one on each side. Undo these bolts. 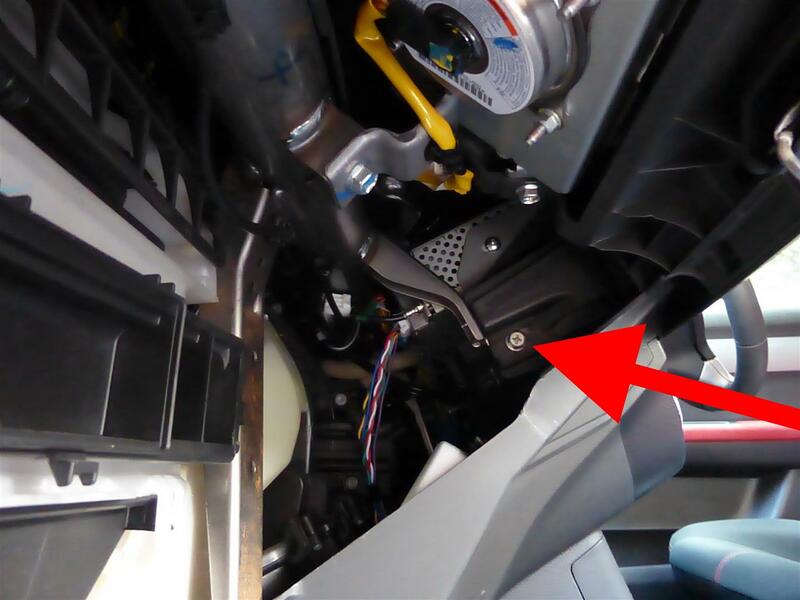 The passenger side (shown in the picture, bolt is indicated by a big arrow) is pretty easy but on the driver’s side it can be pretty fiddly due to access. I used a screwdriver with a flexible shaft which helped a lot. These are the only two you need to remove. Once the two bolts are removed, you then need to unclip the fascia panel. Using a trim removal tool or a large flat-head screwdriver, very (very!) carefully slide it up from below where it meets the heater control panel and gently lever at the two points shown by arrows in the pic to cause the clips to pop out. Do be very careful so as not to scratch the heater control panel. After successfully unclipping the fascia, the stereo should then slide out forwards. You might find that the wires are too short to fully pull it out, but if you snip the cable tie that holds them then there is much more wire and it should come out cleanly. Disconnect the wiring connector and aerial connector. Before putting the stereo aside, you need to undo the 4 screws that hold the cage to the stereo, because we will want to re-use this cage. Installation of the new stereo is pretty much the reverse of the above. Connect the blue socket of the wiring adaptor to the blue Suzuki wiring connector plug (clearly visible in the pic to the left). Connect the manufacturer-specific steering wheel adaptor to the grey box of the wiring adaptor, and connect the manufacturer-specific end to your new stereo. For my JVC stereo, there was simply a single wire labelled “steering wheel remote” and on the manufacturer-specific adaptor there was a 3.5mm jack plug and a wire with a bullet connector. The 3.5mm was for older models and the single wire is for newer ones. I used an automotive snap connector to join the two single wires together and did not use the 3.5mm connector. Obviously different manufacturers will have different ways of connecting the steering wheel controls. Now plug the black ISO connectors into the new stereo. On my JVC this was achieved by using the supplied ISO to JVC adaptor. Your stereo might do similar, or it might take ISO connectors directly. At this point you may want to turn on the ignition and check that everything works, rather than getting it all installed and only then finding out that it doesn’t. 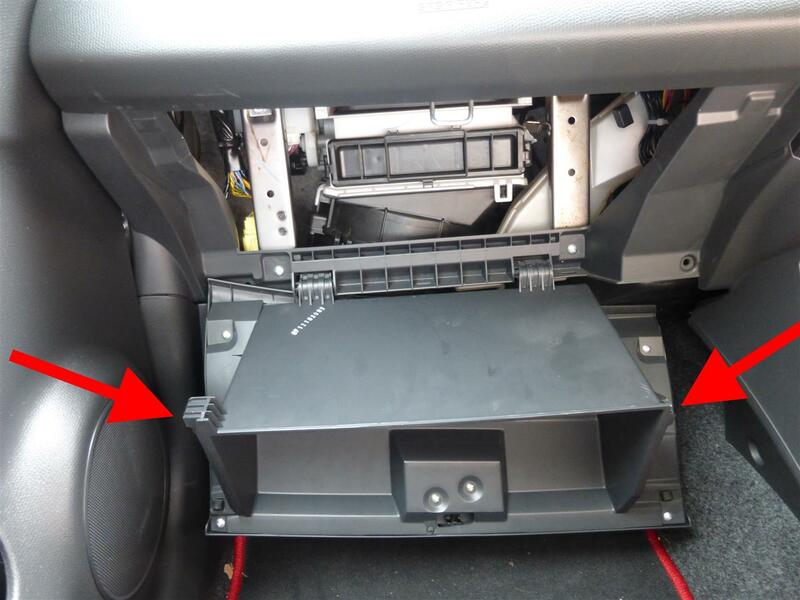 If all is well, bolt the stereo into the cage that came off the old one, and then slide the new stereo into place and bolt it in by re-using the two bolts from the original stereo. Don’t do them up completely tight just yet though. The next step is to clip in the new fascia panel, and the reason we didn’t do up the bolts tightly is to help us do this. You might need to jiggle things around a bit until they line up. But once lined up, the panel should just clip in and the stereo should be pretty much fitted. You can now tighten up the bolts completely. If it won’t line up, then take it out again and try adjusting the cage and then retry. Once you are happy that all is well, tidy up the cabling behind the stereo. The best way to access this is from the passenger side, I found. Use cable ties (zip ties) to make it all tidy, especially if like me you have a whole chain of adaptors and the like. You don’t want these flapping around whilst cornering! 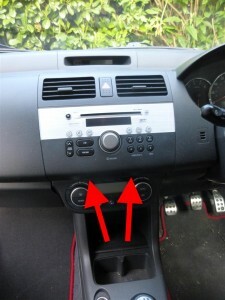 Don’t forget to secure the adaptor box of the steering wheel controls too. I used extra strong double-sided self-adhesive foam pads. Finally, replace the glove box on the passenger side and also the panel on the driver’s side. As you can see, the fascia panel looks a little cheap and plasticy, but it’s tolerable and doesn’t look too bad. A very similar procedure to this one, but on a left-hand drive car. It also has a wiring diagram and also goes on to talk about how to fit a sub-woofer. Tagged aftermarket, DIN, fitting, fitting guide, how to, HOWTO, ISO, ISO 10487, ISO 7736, stereo, Suzuki, Swift, tutorial. Bookmark the permalink. Very useful tutorial but can you tell me where you bought the adaptor for the cabling and what was the price of it (if possible I’d like to get the steering wheel command module for a Pioneer system)..
Hi Eric. And thank you. The cable adaptor I bought from Connects2 via Amazon, and it cost £19.77 at the time. The fitting kit (fascia, plus all the not needed bits) I bought from eBay from a seller called dynamicsounds00 and that cost £30.90 but as I mentioned in the article, it came with way more stuff than is actually needed. Did you manage to install stereo and what was your thought on it? Are they worth it? the most helpful thing I’ve found on the internet about replacing my factory fitted head unit. did you have to splice any of the wires ? 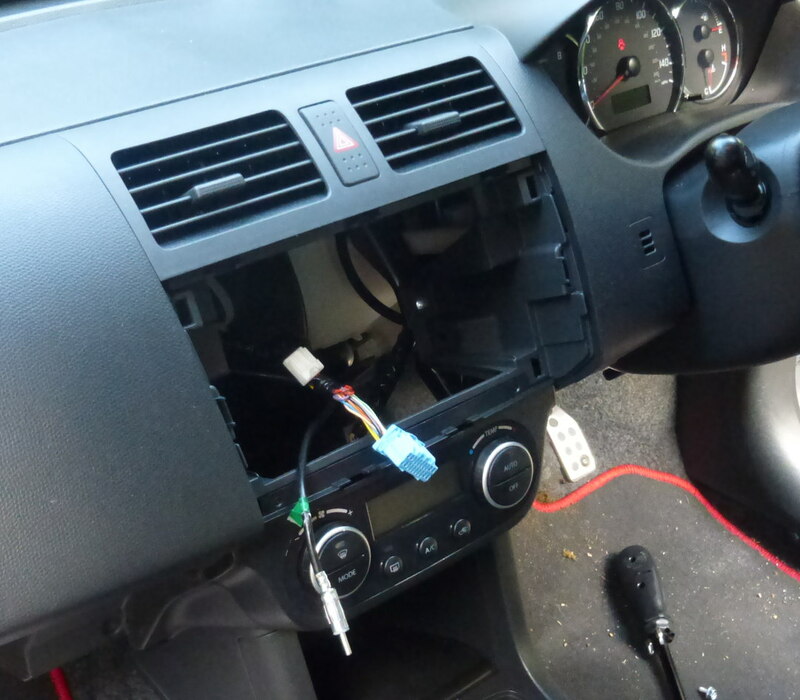 The only splicing was using an Automotive Connector to connect the steering wheel control wire, and that was because my JVC unit uses a single bare wire for the remote. Other than that it was done with harness adaptors (in the case of my JVC unit, a JVC to ISO adaptor, connected to an ISO to Suzuki adaptor, connected to the Suzuki’s main stereo connector). Brill, thanks very much for this. Fitted a pioneer double din today. Thank you for this. 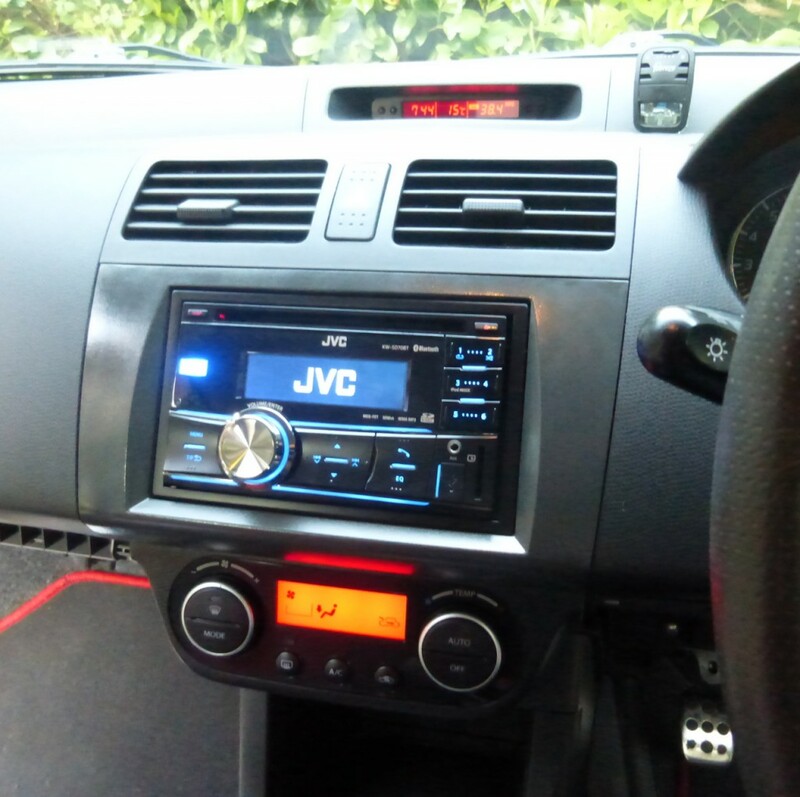 Fitted a Pioneer to my daughter’s newly acquired Swift. Also had to do some cutting and splicing to get the steering wheel controls to work. I used Aerpro wiring harnesses (Suzuki to ISO and ISO to Pioneer). Looking at the pinouts, 19 and 20 from the Suzuki connector were bare on the harness so I cut those wires and spliced them to connect to a 3.5mm audio jack which then plugs into the Pioneer for remote control. Works well. Incidentally though, one of the pins on the Pioneer connector does appear to be able to connect to a remote (according to the tags on the plug with loose end wires that came with the unit) so there may be other manufacturers whose harness connect the steering wheel through as well.